One of the most important feature of this year for me has been my music and more so on my blog. Things have come and gone, many thigns have changed a lot, yet the only constant through this tumultous year for me has been my music, even when my life had almost deserted me, it was the music which played a major part in keeping me sane. Thats why I thought what better way to end the year but with a post on a song, yet again. I have written a lot about the english music and shall be (hopefully) doing so, in near future as well. Thats why, a little bit of detour lands up us at Sahir Ludhianavi from Paul McCartney. Since inconcievable time, I have always been enamoured by Sahir Ludhianavi, to my own admission, I havent listened much of his writings. Yet, the very rare that I had the pleasure of listening, has been exemplary. I generally dont have much fondness for the music of Amitabh Bachhan era, specially his songs, yet the 2 songs of AB, which I prefer the most have been penned down by Sahir Ludhianavi. Rafi as I have alread mentioned has been my favourite male singer in bollywood. S.D.Burman has since time infinite been my favourite music composer, while the world has always gone gaga about the other Burmam, but for me its always been the elder Burman, who called the shots, never liked RD as much. 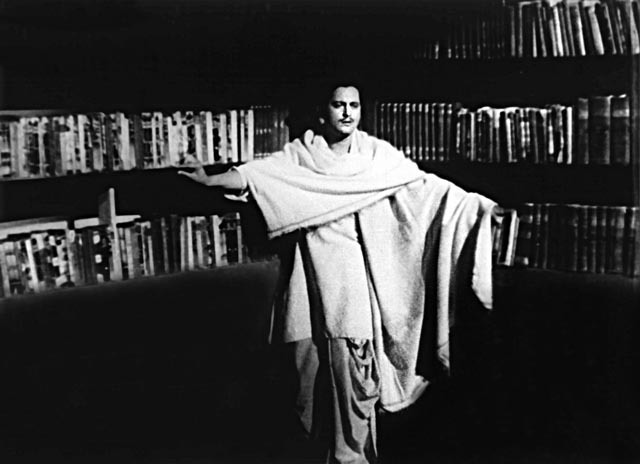 While Guru Dutt is a genius whose standing in hindi film industry has been rarely challenged by people coming after him. Its only when all 4 of these people met in a song that we could get the awesomeness better known as Ye duniya agar mil bhi jaye . Its only been 53 years since the song and the movie were released and the song carried on just by the soulful voice of Rafi with almost nill instruments, might seem to be the death cry of a person and could be rather too mellow to be considered a song. Still, a few listens of the song or a read through the lyrics and you are just too overcome by the beauty, the pain, the euphoria of the song to be able to say anything and any effort to describe the song in any way shall remain rather futile. Even I shall not dwell too much on the lyrics or any aspects of the song, beside just stating perhaps a million times that things rarely do come better than this. 1. What did you do in 2010 that you had never done before? 5. What date from 2010 will remain etched upon your memory, and why? 9. Whose behaviour merited celebration? 10. Whose behaviour made you appalled and depressed? 15. What do you wish you had done more of? 16. What do you wish you had done less of? 18. Did you fall in love in 2010? 19. How many one night stands? Paul McCartney, I was a Beatles fan till 2009, became a Macca fan in 2k10. Turned 23 this year, nothing much, just usual! Family, friends and perhaps a bit of courage! 29. Tell us a valuable life lesson you learned in 2010. PS: Taken from Sunshine’s blog! We (atleast me) have heard a lot of special Dylan, Lennon, McCartney songs through the anals of rock music. Best thing about musicians is, the inspiration they take listening to each other’s music, observing then write and work. Lennon did a Dylan first, then Dylan did a Lennon which had only left Paul McCartney as one of my all time fav artist, not to be in the mix, and that’s when Get Back come to my listening circles. Most interesting part of the song is, the lyrics and the theme/tune of the song. This is a pure McCartney song, where you are blasted with his super amazing voice in the starting of the song along with the Ringo drumming at its full fore, pretty strange for a Macca song. Which mostly rely on less of instruments, and even if needed, they are piano/guitar, never the heavy thumping of the drum. An interesting aspect of Lennon’s writing always is, the slogan or catch phrase writing which he does. Give Peace a Chance, Imagine, All you need is love, You know my name, there are countless such examples and this is the exact same technique applied by Macca. Such songs, generally have a strong line which is the whole-soul of the song, while there are a few lines thrown here and there, many times they wont even make sense, sometimes they might be a >conversation between 2 people, while the theme line takes most of duration of the song. The aforementioned features (more or less) in above songs can as well be, very easily observed in Get Back. 1. According to Lennon, Paul looked at Ono, everytime while singing the line, “Get Back to where you once belonged”. 2. Although many artists like Clapton have recorded with Beatles, but no one ever got any credit in Beatles songs, Billy Preston, for this song is the only Non-Beatles to have ever got a credit on any Beatles song. At the onset I would like to thank you as a nation, as from time infinity (that is since India left the Antartic plate and crashed into the Asian plate), we have been very gratefully endowed by your sparkling rays which have been the constant source of energy and life for us. Unlike some of the countries in higher latitudes, we dont have months of night and neither do we have the inclement winters, and are allowed to live in a weather which wouldnt be termed gloomy. Keeping in mind, all these points, there are somethings I wanted to discuss with you. Although, you are heartily welcome in our parts as and when you decide to shine upon us. Yet, as the adage goes Too much of anything is bad. As we keep moving to the southern parts of our country, your affinity also keeps increasing, and instead of 3 months in higher latitudes, and 7-8 months in northerm part of India, you keep increasing the months allotted to you. All these years, circling around the earth (as we see it), you must have got to know humans quite closely, and humans as you might know, are rebellious creatures. No sooner do they get used to something, they rebel against the system. We living in Hyderabad, are quite used to bearing your brunt almost through the years. But, there are months in the Gregorian Calendar (mostly December and January) which are supposed to be free from your interference. I’ve had enough for you. India – The hosts, the arguably(?) best team at the moment, though the reality should be clear after the SA tour. Only thing I can say is, they would be unfortunate not to win this cup. They have The Best batting line up in Tests & ODIs, in Dhoni they have a smart enough captain and perhaps the best keeper batsman beside Sanga (yeah I Know McCullum! ), bowling, they have Zaheer and well.. Others! Bhajji, we are still hoping he will perhaps perform, Praveen Kumar and Nehra are good to okayish for ODIs. Although in the end it shall all depend on Batting and ofcourse The God. Man to look out for – Are you asking Me? Sri Lanka – Good team, great composition and since this is the sub continent, they are always there. Have got a good batting line up and in the form of Malinga and Murali(?) they have the power in bowling. Yet, to me the most important person of this tournament for them could be Matthews, the player you would love to have in ODI’s, he can bat well, he can always be depended for a good spell and quite frequently wickets. He is the man to look out for! Man to look out for – Angelo Matthews is my pick. Man to look out for – Eoin Morgan,He is the one Sachin tipped. He’s exciting, the ideal guy for sub continent. South Africa – Oh the perennial favorites, and the perennial chockers. They never have had any problems , they have been almost the best team always, they would have players, they will win matches and yet something or the other would happen. In Amla and AB, they have the 2 best ODI batsmen, Smith is there and Kallis, is still there, he’s never gonna leave you. They have Steyn and (?) Morkel. Only problem they seem to have is of a quality spinner(which they never have had) although some Pakistani player who shifted to SA could be an answer. Man to look out for – Well they have always been a team.. May be AB? Amla? Pakistan – Perhaps for the first time ever, you rank them in the lower category. They have always been mercurial, they will always surprise you, that’s why even mediocre pakistani teams have been rated highly. Yet, this time, it feels like too much has happened. I wouldn’t be surprised if Bangladesh can defeat Pakistan comprehensively. Player to look out for – Are there any left? West Indies – This is where it starts getting inconsequential. You have all your lives hoped for a Caribbean revival but it has never happened and although they have fared okayish in sub continent but still 2nd level. Player to look out for – ? New Zealand – Would have put them above the windies but a 4-0(even if you don’t consider Bangladesh as minnows) and a 5-0 loss, it just doesn’t give me confidence at all. They have the players who can perhaps by the sheer grit save matches for you, but this is not test matches we are playing. They just don’t have the fire power and in the sub continent, you cant do without it. Bangladesh – Could I put them above NZ, given the current affairs? Somehow the conventional wisdom sets in. With their slow left armers and a guy names Shakib-Al-Hasan, they definitely are going to the 2nd round, specially given the home crowd. Their they might won some matches but don’t see them going ahead. Although stranger things will happen. Readers – Can they make this one a SL 1996 kind of triumph? Zimbabwe – Frankly, my dear, I don’t give a damn! PS: Bear with the arbitrary links, checking out a WP feature.